I have played professionally competing at club, National and International Level. An on court assessment is usually suggested so that I can analyse your current ability and pinpoint your strengths, assets and desires. I will then be able to review your strengths and areas to improve on. This will enable me to design a bespoke coaching plan to maximize your potential. A combination of hard work, and great coaching will result in you achieving your goal. 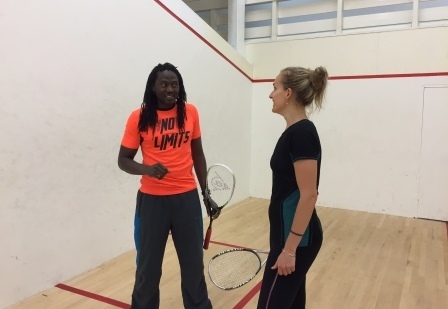 Understanding the rules of the game of Squash. Specific footwork and Techniques of hitting the squash ball. Developing Good Timing Tactics and Strategy. Fitness Training and Psychology learning to compete effectively safely. All of this taught by a seasoned pro who still competes at the highest level. To anybody thinking of hiring Mas, just do it! The coaching he offers is amazing, and on top of that, the support is outstanding! I came to him with a few weak points in my game, he managed to iron those out in no time! I would like to extend a special thank you for your excellent support. Is has been a great experience. I had not picked up a squash racket for over 16 years. Your patience love and excellent support and feedback has been wonderful. Thank you for all of your help! Thank You for bringing out the best of me! My game is now on a whole new level.